I've been busy, did you guess? I finished 2 stealth projects. 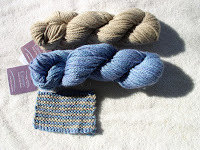 The socks for Plymouth Yarn are finished and delivered. Would I like to design another pair of two-color socks? You bet I would!! I also finished a baby sweater for DRG publishing. It's for a book called Circular Knitting Redefined. 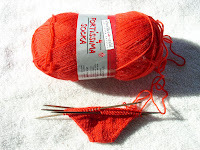 Knit back and forth using circular needles. That one is waiting for USPS pick up. The pattern has been submitted electronically. This one has been knit 3 times before. Two of the sweaters were family gifts. The third waits for a baby girl. At first I didn't write the pattern, then when I wrote it, I wanted to revise it. This time was pretty easy, because the yarn gauge was the same as before. Knitting now on a pair of socks for a birthday later this year. I hope to sell this pattern too! This is a lace pattern. Ravelry Sock Knitters Anonymous had lace as the March challenge. Finish the socks by the end of April for a chance at prizes. I can do this! Show a picture of the finished socks. Flash photos do well at blurring detail. This month's challenge is to knit an under appreciated pattern. Look it up on Ravelry and see if less than 15 people have knit it. I have a great Entrelac pattern picked out. If it suddenly becomes popular, I'll go to my book shelf. Don't think that will be needed. This pattern called to me as soon as I saw it. 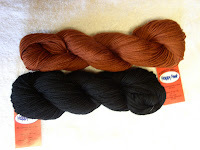 I have the recommended yarn. It's more complex than most knitters want to tackle. I'll check when these red socks are finished. Something needs to be cast on before month's end. This pair will be mine!! The next few socks will be gifts for guys. No birthdays for a couple of months, but then they come in bunches.